RAF Elsham Wolds in Lincolnshire, England, opened in July 1941 as a heavy bomber station in No: 1 Group, Bomber Command, and for over four years was the home of No 103 Squadron, which operated with Wellington 1cs, then Halifax IIs and finally with Lancaster IIIs, against a wide variety of long and short range targets. The station had only been open three months, when, on the night of October 22, 1941, my friend, Pilot Officer Kenneth Wallis, RAFVR, was captain of Wellington 1459, PM-X of 103 Squadron, on a raid against Mannheim, an industrial town at the confluence of the Neckar with the Rhine. Founded at the beginning of the 17th century, Mannheim suffered severely during the Thirty Years' war, and was again destroyed in 1689 by the French. Now it was on RAF Bomber Command's target list. For the Mannheim target, for these were early days, Wallis's Wellington bomber had a crew of five, but a normal crew was six. The twin-engine Wellington bomber had a range of 2,850 miles, service ceiling of 24,000 feet, with a cruising speed of 232 miles per hour at 15,000 feet. On the night in question, there were intense thunderstorms, and trouble began almost immediately after leaving the English coast. The oil coolers, presumably due to water in the system, froze, and the second pilot was unable to pump any fresh oil to the engines, the pump handle and piston assembly breaking from the pump. Wallis continued to target, and after bombing the target from 16,000 feet, the aircraft started its return for base, and in the process suffering intense flak over Liege. "I came forward from the navigator's compartment, and got the feeling that he was flying the aircraft in a 90 degree bank, a cloud 'horizon' in the night sky appearing to be vertical," he said. "It was actually the side of a giant thundercloud. I climbed into the pilot's seat and tried to coax the engine back to life with de-icing fluid, only to have the other engine ice-up also. The windscreen was now covered in ice and it was impossible to see. Then, both cylinder head temperature gauges dropped to zero, and we lost height, completely 'blind' from 14,000 feet to 1,000 feet." Meanwhile, the wireless operator was sending an SOS, although there was little hope of a successful 'ditching' in the stormy sea. Pilot Officer Wallis was fighting a full-time battle to keep the bomber in the air, and like a beautiful woman, needed the gentle touch and coxing of a skilful gentleman; and his masterful ways with engines paid off, for just when there seemed no hope, one engine screamed out in fine pitch, and then stopped again. It fired once more, and Wallis was able to nurse both engines back to life, just above the sea, and beneath the icing level. His thoughts were only on the engines and getting back to base. Furthest from his mind were the balloon barrages for enemy aircraft, but that was soon to change. The Germans knew the dangers, and had tried many devices to overcome the danger of hitting balloon cables. One idea that the Germans experimented with was a fender on the aircraft to push the cable clear, but it had the big disadvantage of considerably reducing the bomber's performance. With engines running irregularly, they resumed course for base, and eventually arrived over Lincolnshire at 12,000 feet. Suddenly there was a flash and a bang, about 18 inches out from the fuselage on the port side, followed by a strange noise, a smell of molten metal, and a very rapid deceleration to near stalling speed. Pilot Officer Wallis immediately realised they had hit a balloon cable, and pushed the nose down to maintain some control. The cable cut through the wing like an oxy-acetylene cutter, severing the fuel pipes, engine controls and hydraulics, but fortunately, the Gods of War rode with Wallis, and the cable broke just after cutting halfway through the main spa. With bomb doors open, undercarriage hanging down, the port engine idling in fine pitch, and no hydraulics for flaps, they slowly lost height, and unable to see the airfield lights, they fired off what Very lights they could. 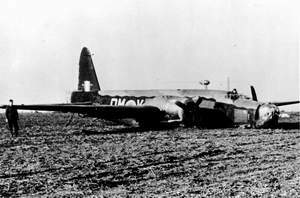 Next moment the Wellington ploughed into a wet potato field, burying the second pilot up to his waist in mud. The aircraft was intact and the crew quickly scrambled out. Pilot Officer Wallis: "With fuel still draining from the cut pipes, and the hot engine ticking as it cooled. I counted the crew, and noticed we had six, though we'd set out with five. I then noticed that one had a rifle; when I approached him in the dark he saluted me and said 'Good Morning, Sir'. He was the guard from the main gate, very near which we'd ground to a stop!" Pilot Officer Wallis and his crew survived, and he went on to become a Wing Commander having completed 36 operations over Germany and Italy. 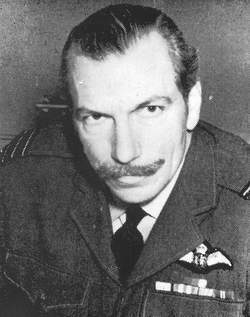 Today 2009, he is famous for the Wallis Autogyro, the most famous being Little Nellie, which he designed, built and flew in the James Bond 007 film You Only Live Twice.